A 33-year-old man was shot July 10, 2017 on North Garland Court in Chicago. CHICAGO (WLS) -- A 33-year-old man was shot in the stomach Monday afternoon in Chicago's Loop neighborhood, police said. The man was shot at about 3 p.m. in the 200-block of North Garland Court near Lake Street and a block from Michigan Avenue. 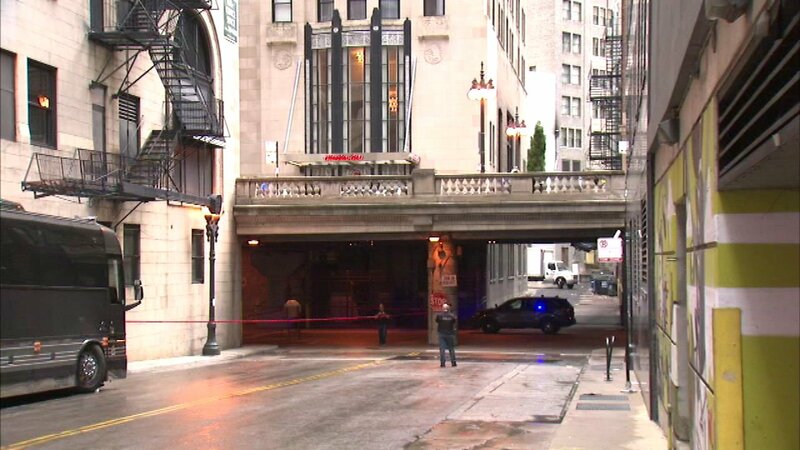 The shooting happened along Lower Wacker Drive and South Water Street. Police said the victim was inside his vehicle when another man fired shots from outside the vehicle, striking him in the abdomen. Curious pedestrians ogled from street level on Wacker Place, and officers turned away frustrated bicyclists who were forced to find another way around the crime scene. A hotel worker smoked outside the crime scene as officers shined flashlights looking for shell casings. "I might've heard a gunshot, but it could've been something else," the worker said. "People are always down here getting into nonsense - selling drugs, drag-racing, fighting." The victim took himself to Northwestern Memorial Hospital after being shot. He was treated and released for a minor gunshot wound to the side of his torso, police said, and refused any further treatment.